What is now called Acadia NP was founded in 1919 as the first national park east of the Mississippi. Acadia is a rare find for motorized campers in the eastern United States. Of the numerous national parks and monuments, only a few in the East are rural and spacious enough to offer campgrounds for RV or car-campers. In northern, coastal Maine, Acadia is within a day’s drive of the huge American population centers of Boston and New York City and also the major Canadian cities of Ottawa, Montreal and Quebec–so don’t expect to be alone. Although Acadia is open all year long, most facilities and roads will be closed during the cold, snowy winter season. Most of Acadia NP is located on Mount Desert Island off the coast of Maine. Autos and RVs arriving from the southwest will leave Interstate 95 at Augusta and take Route 3 to small town of Ellsworth. Coming from the northeast, drivers will leave Interstate 95 at Bangor and take US 1-A heading south also to Ellsworth. Campers coming from the north on US 201 and from the west on US 2 will join Interstate 95 east of Bangor and then take US 1-A to Ellsworth. From Ellsworth, continue south on Route 3 following signs toward Mount Desert Island, Acadia NP and Bar Harbor. Once on the island you will see signs for Hull’s Cove Visitors’ Center and the entrance to the famous Loop Road. Pay your entrance fees and procure you park map here. Note that the Bar Harbor ferry, The Cat, to and from Yarmouth, Nova Scotia in Canada is no longer operating. The park averages 51 inches of rain and 61 inches of snow annually. Expect rain twelve months a year and snow or ice in the cooler eight. Choose clothing that reflects the seasons and be prepared for bugs in spring and summer. Acadia’s weather is largely a product of latitude and marine influences. On a daily and annual basis, Mount Desert Island temperatures are more moderate than those of inland Maine. The Maine coastal climate has been ranked second only to the Pacific Northwest in annual precipitation. This moisture occurs in every form at Acadia. Ice storms are regular in winter and early spring, and rain is frequent in every month. Fog is common during June, July, and August. Spring can be foggy with temperatures ranging between 30 and 70 degrees F. Wear light-colored clothing, long sleeve shirts, and long pants for bug protection. Summer daytime temperatures range from 45 to 90 degrees F. Evenings are cooler. Dressing in layers is advisable for any boating or hiking activities. Ocean water temperatures range from 50 to 60 degrees F. Lake water temperatures range from 55 to 70 degrees F.
Fall temperatures can range from low 70s during the day to freezing during the night. Come prepared for all types of weather, from sun to fog, from downpours to flurries. Fall foliage often peaks during the first few weeks in October; the peak time is generally mid-October. Weather conditions over the summer, such as drought, may alter the time that the leaves peak. In the Winter, due to Acadia’s coastal location, snow and weather conditions change rapidly. Temperatures vary from mid-30s to below zero. The park averages 61 inches of snow during the colder months but rain is also likely. As I have mentioned in previous articles, your chances of finding or reserving a suitable campground in a national park are much better if you avoid weekends in high season and holidays in particular. During peak season, make reservations well in advance if you want a spot in a central or popular campground. For the smaller, quieter, or more out-of-the-way campgrounds, show up at the park early on a weekday and make securing a campsite your first order of business. There are four campgrounds in the park but only two are suitable for most motorized campers These two primary campgrounds in Arcadia are both located on the southern parts of the main island, Mount Desert Island. There is no backcountry camping in this compact and busy park. The largest and most central of Acadia’s campgrounds is Blackwoods Campground. Located on southeast Mount Desert Island along Route 3, Blackwoods is open all year but reservations are required during peak season. In winter the water is turned off, most loops are closed, and camping is by walk-in, tent camping only. Although there are many sites in this large campground, they are well spaced and the thick forest makes for rather pleasant and private camping. 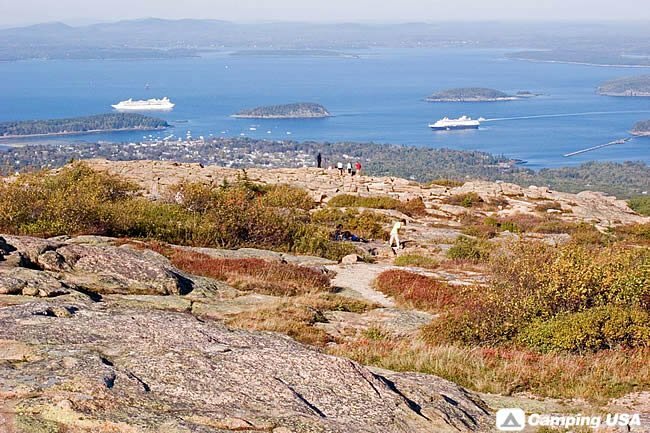 Blackwoods is located within a short walk of the ocean plus the four-mile South Ridge Trail up to the summit of Cadillac Mountain starts here. 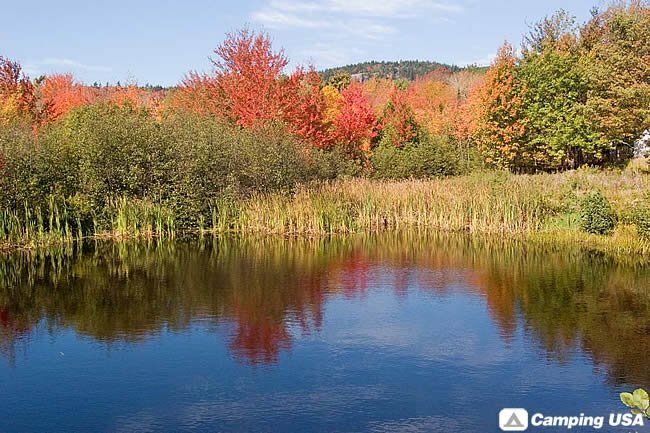 There are short drives to other hiking trails, the famous Carriage Roads, beautiful Jordan Pond, the popular Cadillac Mountain and Loop Roads, and the quaint but busy tourist town of Bar Harbor. Supplies and showers are close by on private lands just beyond the park boundary. 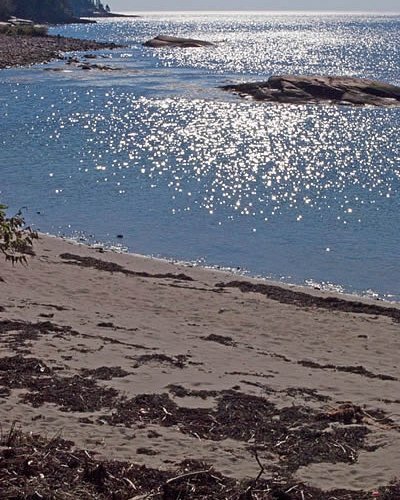 Smaller Seawall Campground is located along Route 102-A on the more remote southwestern arm of Mount Desert Island. Although open only in high season, half of the sites are first-come fist-served, so Seawall would be your best choice if making a more spontaneous and unplanned visit to Acadia. The sites in Seawall are large and forested so there is some privacy in this rather sprawling campground. The Seawall, the rocky coast, is only a short walk away and the foot trails around Long Pond and Echo Lake are not far by auto. A slow, longer drive, 10 or 15 miles, will get you to the busy center of Acadia Park with more walking tails, the Carriage Roads, the Loop Road and ultra-touristy Bar Harbor. Supplies and showers are found nearby in private establishments. There are two other campgrounds in Acadia. Backpackers will enjoy primitive Duck Harbor Campground. Locatedon the separate, small, car-less island of Isle au Haut and reached only by passenger ferry from Stonington, this small campground requires a short hike to lean-tos or tent pads. Don’t forget to bring a tent, your sleeping gear, stove and food. Campers with stock trailers can park and camp at Wildwood Stables, on the southeastern portion of Mount Desert Island, off the Loop Road. Access to the park’s popular system of Carriage Roads is easy from Wildwood. If you can’t find a camping spot in the Acadia National Park, keep in mind that there are about a dozen private campgrounds scattered around Mount Desert Island and close by on the mainland. Acadia Park is of course noted for its 125 miles of foot trails (hiking only), the 45 miles of Carriage Roads (hiking, biking and horse riding), and the 20 miles of scenic Loop Road (biking and driving). Auto tourists and bike riders will also enjoy scenic back roads outside the national park’s main boundaries. Passing through the rustic farmlands and quaint fishing villages of coastal Maine, these roads provide access to the many separate, more remote sections of Acadia Park. A full list of summer activities would include: biking (mnt and road), birding, boating, canoeing, climbing, fishing, hiking, horse riding, kayaking (ocean and lake), leaf peeping, scenic driving, swimming, tide pooling, and whale watching. Commercial tours by bus, boat, and horse-drawn carriage are also available in season. Winter activities include: cross-country skiing, dog sledding, ice fishing, ice skating, snowmobiling, snowshoeing, skijoring, winter camping, and winter hiking. I hope that this brief guide will aid your planning for a camping trip to Acadia National Park. Whether in your RV or tent, you will never forget your adventures in this compact ocean and mountain paradise.